Staying in touch with clients and reaching out to prospective clients keeps your real estate business at the forefront of their minds. A person may not be ready to buy a house or sell his or her house just yet, but if you keep reminding that person that you are the real estate agent that can get the deal done, you’re going to be the one that person calls when it is time. So, just how do you stay in touch without being pushy? Send your prospective clients little reminders in the form of gifts that are usable. In addition to sending the right gift, you need to pick the right time to send the gift. If you are sending a baseball schedule, you need to send that a few weeks before baseball season starts. If you send it in the middle of the season, or even worse, at the end of the season, it’s going to be chucked in the trash. Calendars should be sent before the end of the old year. If your prospective client buys a calendar, guess where yours might end up. Timing is everything, so when you choose a reminder gift to send out, keep that timing in mind. The 2019 MLB season is set to start on March 28 this year. You still have time to order baseball schedules for your local teams and get them to your current and prospective clients. Schedules may be ordered on full magnets, magnetic business cards, magna cards and laminated wallet cards. It’s always nice to be remembered on holidays and that goes for clients. Show your clients some love by sending them a 4th Of July postcard. Choose from several designs including recipes for July. During the summer, people are always looking for new recipes to try for summer gatherings. Pick our recipe cards for the summer months to send to your clients once every month. The recipes are all mouth-watering and easy to make, so your clients are sure to keep them around—and will see your name every time they make the recipe on the card. Preseason usually starts in August of every year, so you have plenty of time to order those football schedules for clients that are football fans. 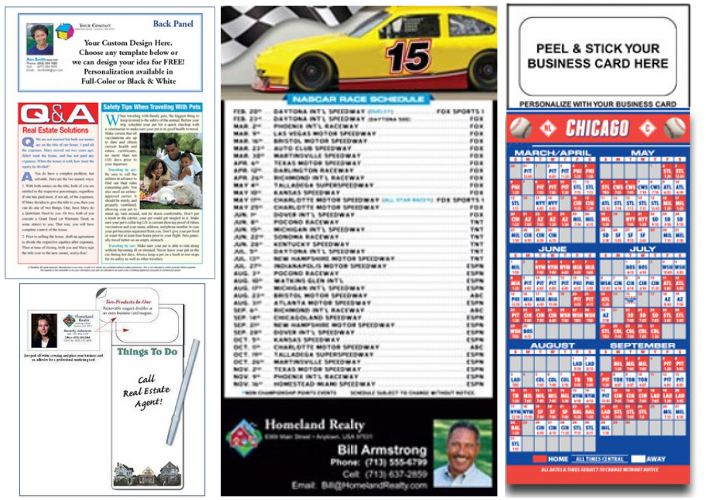 As with the baseball schedules, pick a format that goes best with your clientele. People who are selling their homes want results, which means a quick sale for the best price possible. This means real estate agents are usually questioned about the number of sales they made in the past few months plus the number of sales that were within a certain percentage of the listing price. You can answer your clients’ questions by sending out market updates every month. By choosing a custom “Just Sold” postcard, you can add up to 10 photos of sold homes to let your clients know you get results. Something that is always used is a memo pad. Many keep a magnetic memo pad on the fridge to write down items they need to pick up next time they go to the store. Or they may use it to jot down a phone number or other information. This is one “reminder” that you know will keep your name in your clients’ minds since it’s hanging on the fridge. And, your clients’ guests will see it too—you may even get a prospective client who inadvertently sends you a new client. Stop by our website or contact us to order a catalog with all the personalized items that will help keep your business in front of your prospective clients’ minds. 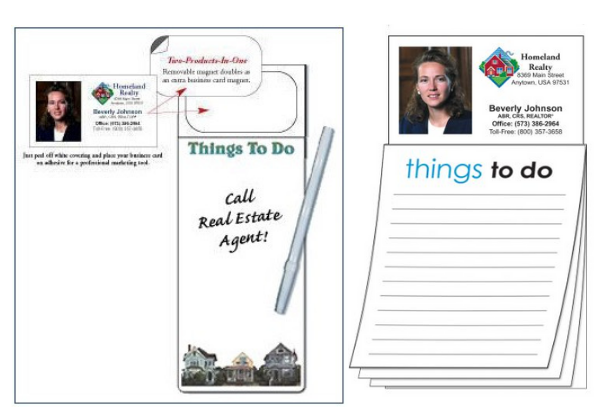 One of the most trusted, proven marketing strategies for real estate professionals is direct mail postcard campaigns. 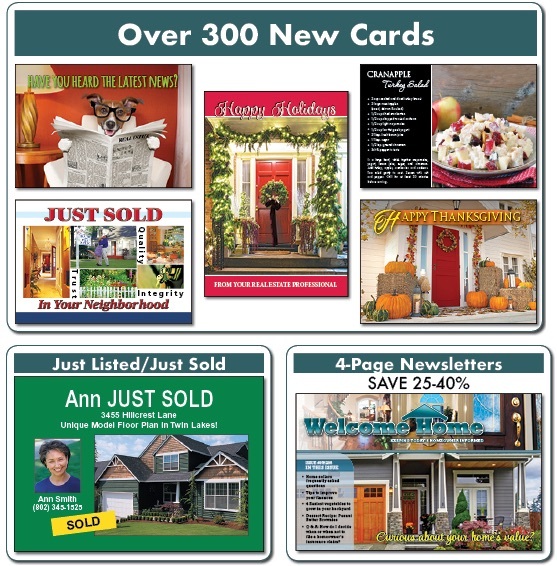 There are several reasons real estate postcard campaigns are so effective. In addition, real estate postcards and mailers can be sent to serve as timely reminders or include pertinent valuable information creating a longer shelf life. 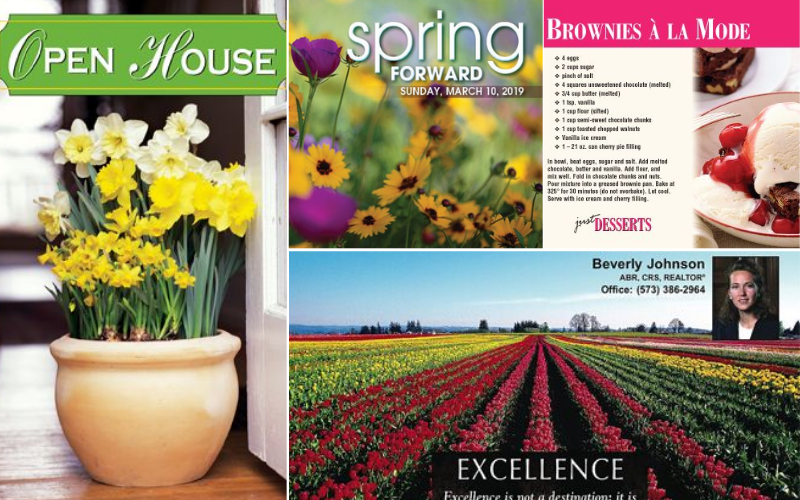 Examples include time-change postcard reminders and sports schedules or home and garden tips. When real estate professionals build year-long campaigns using these powerful marketing tools, their effectiveness increases as potential prospects turn into leads and leads become sales. One of the biggest mistakes those in real estate can make in planning a postcard campaign is not setting the right objectives. Here are some thoughts to keep in mind. When setting objectives it is important to know the value of a quality or qualified lead and prospect. In real estate, this value can be quite high. Knowing this helps set the proper expectations for a real estate postcard campaign and the resources you invest in it. A single quality lead can ultimately be worth thousands of dollars to a real estate professional. If a postcard campaign returns several of these quality leads, it can pay significant dividends. If your core objective is to gain immediate leads, your message may need more urgency than if you are building your brand and nurturing potential leads. For example, a postcard that touts the sale of a nearby home or new listing, or other area real estate-related news may have more urgency than a postcard that has a seasonal recipe. Keep in mind any contact with a postcard still increases name recognition and exposure. 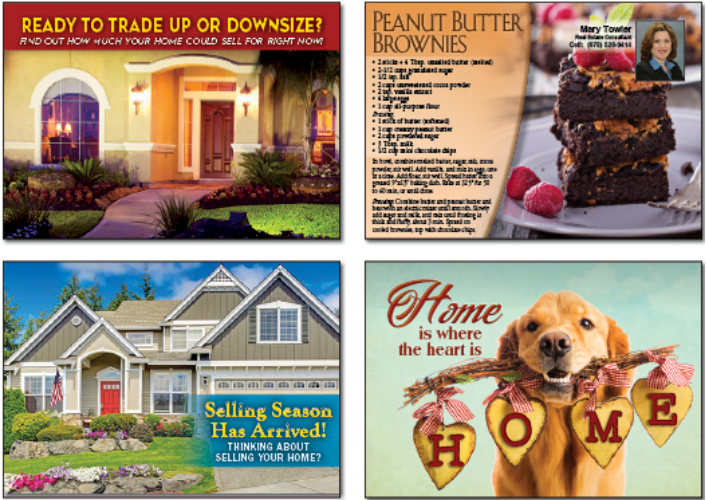 Real estate postcard campaigns are not meant to be “mass marketing.” Real estate postcard marketing campaigns are generally targeted to a specific geographic area, demographic, income level or style of home. This eliminates waste by focusing your efforts on the group of prospects with the most potential value to you. The better you define your target market, the clearer your objectives can be and the more likely you will achieve them. There are a lot of variables that need to be taken into account in creating real estate postcard objectives. Is it a buyers’ or sellers’ market? Do you already have a reputation in the business or are you building one? What are you asking recipients to do? If, for example, you are giving away a valuable prize and only want recipients to sign up on your website, you will likely get more responses that if you initially ask them to request a free in-home appraisal. Test various types of cards with differing calls to action to determine expectation and objectives for your next campaign. 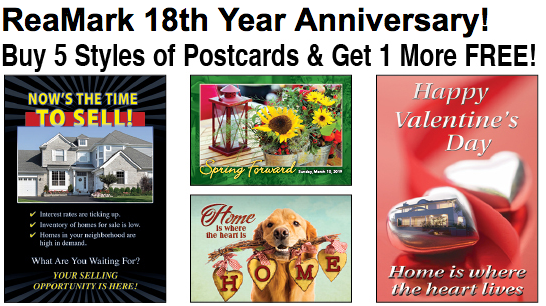 For almost two decades ReaMark has been helping real estate professionals create, design and implement successful postcard campaigns. We can assist you. Our professional staff will help you develop a campaign that will be effective and that meets and exceeds your expectations. We offer free design assistance and a wide selection of products created to deliver results. We can even help in creating your EDDM (Every Door Direct Mail) campaign. Contact us today and meet your objectives for real estate season with ReaMark! Traditional mail and email may seem like opposites, but in the real estate world, they go together like peanut butter and jelly. You can use these tools to target different audiences, build authority, nurture leads or reinforce your current message, so there’s no lack of strategic outreach options. Here are some reasons realtors love combining traditional mail and email. Think you’ll win the most hearts by enabling your farms’ addictions to email and social media? These marketing channels have notoriously low response rates, so you’ll need to work extra hard if you restrict yourself to digital opportunities. Direct marketing statistics for 2018 and 2019 seem to reinforce this concept. Only about 1 percent of people respond to emails, social media and paid search, but 9 percent will reach out to brands that send them mailers, such as sports schedules or postcards. Even if you catch someone’s attention via email, your time in the spotlight is fleeting — About 78 percent of inbox marketing gets diverted to spam folders or deleted instead of being read. The persistence of direct mail may have something to do with neuroscience. Research by Canada Post Corporation used eye-tracking and electroencephalography, or EEG testing, to survey people’s brain responses to promotional media. They determined that direct mail was associated with lower cognitive loading, or the amount of mental effort needed to understand the material. They also found that it was more persuasive and likely to drive behavior than emails were. While some digital ads leave deeper impressions than others, they’re generally not as good at keeping people engaged for the long haul. Direct mail takes less time for people’s brains to process, so they may be more willing to interact with the brands it promotes. Data from 2017 suggested that combined outreach approaches drove success rates 35 percent higher than what might be expected from direct mail or email alone. There may be a few reasons for this trend, including the fact that you’re reinforcing the message by giving people the chance to view it from numerous angles. Other research showed that people were more likely to spend when businesses used both tools together — Patrons sunk about 25 percent more money into these companies. More pressing for realtors, 75 percent of one study’s subjects could remember brands after seeing direct mail as compared to only 44 percent for email. People also said that they felt like they were being treated with increased regard when receiving physical mail. Such sentiments could prove key to establishing respectful, profitable relationships with consumers. Even if email blitzes are faster routes to certain customers, they don’t always send the right messages. Neither direct mails nor emails can solve all of your marketing problems. There’s no anticipating which of your ads a potential client might be staring at the instant your branding clicks with them, so cover all of your bases. Emails and direct mail serve distinct purposes, so be discerning about which branding objectives you use them to achieve. For instance, Every Door Direct Mail, or EDDM, postcards capture the attention of entire neighborhoods economically, and you can follow up with those who respond via email. Mailers like branded sports schedules and market updates get people to associate your name with useful information, but emails may be helpful for those doing their own in-depth market research. 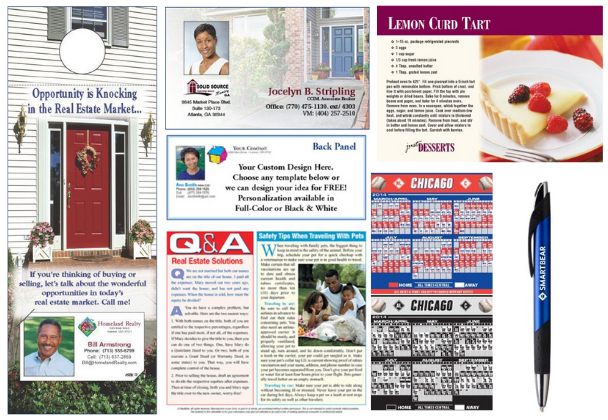 Quality marketing materials are the keys to a perfect real estate advertising approach. Unify your digital and physical marketing campaigns by talking to a Reamark expert today. Securing leads isn’t always easy, but as a real estate agent, it’s essential to get over the hurdles. As consumers evolve, their tastes also change, and 2019 is almost certain to bring new norms in outreach. Your old campaign strategies might not cut it. Confused about how your marketing plan fits into an uncertain future? Here are five simple pointers for better real estate branding in the coming year. Realtors who want to establish ties have a variety of touch points at their disposal. For instance, sales agents commonly send out calendar magnets at the beginning of the year to ensure people keep them in mind for months to come. House flippers, on the other hand, might focus on image-packed social media posts showing their latest before-and-after successes. Start coordinating your efforts. For instance, your calendar magnets should definitely include social media links. When people subscribe to your email newsletters, your database software ought to place them in a different mailing list reserved for nurturing established leads. You’re fighting a war for attention on multiple fronts, so ensure that your attacks support each other. Tired of feeling like you’re drowning in a sea of campaign stats? Effective marketers periodically reassess their data collection and analysis practices. This highlights trends and helps you make wise branding choices. If you’re like most agents, then you’re probably tracking social media engagement on several platforms. For clarity’s sake, organize your dashboards to automatically show the few sites with the highest numbers and group the rest into a general low-performance category. Sanitizing your data will make you less likely to mistake noise for noteworthy trends. The new year is also a logical time to conduct a strategy audit and identify the most important performance indicators. People respond to the same messages differently depending on when they receive them. Although you can’t always anticipate when the mail carrier will deliver your latest greeting cards or door hangers, you can definitely set the pace for followup interactions. Don’t think that timing is a big deal? Try cold calling someone late at night or early in the morning, and you’ll quickly realize how important it is. You might be making social media posts in the wake of a printed mailer blitz or sending emails, but it’s critical to accommodate your audience’s habits. Whether you’re farming different neighborhoods or sending out cards for different holidays, you need clarity. Why not make it easier to track leads on a per-campaign basis by including unique QR codes for each group of mailers? From there, you can use engagement software or normal spreadsheets to organize the response data to reveal which types of outreach correspond to the biggest successes. Client personas are essential in an era where people expect highly personalized marketing. Facebook and other tools may give agents unprecedented access to fine-grained consumer information, but it’s vital to associate the feedback with the right audience pockets. Your marketing doesn’t have to be super sleek, but it must be polished and coordinated. It doesn’t matter if you’re targeting consumers who might favor the appeal of quaint aesthetics and plain language. Using consistent marketing elements reinforces your message and highlights your professionalism. You’ve probably already got a few core brand assets, such as your logo, trademark or tagline. Start the year off right by finding a design team that can help you create universal marketing standards using these critical components. Imagine that you mail out completely different postcard designs every few months. You might restrict your use of fonts to make your value proposition more noticeable or keep the contact information in the same position so that people know where to look. These advertising design fundamentals will become even more essential as 2019 forces you to compete with new marketing techniques and technological distractions for people’s attention. A real estate agent’s fate depends on their ability to make inroads with new audiences. While there are plenty of potentially viable avenues for establishing contact and forging relationships, direct mail continues to stand out. Thanks to its low-cost, straightforward nature, direct mail is one marketing strategy that isn’t going away anytime soon. Want to achieve real estate lead success? Finding great properties isn’t only the challenge. In 2019, everything will revolve around finding buyer and sellers who need your expertise and getting them excited about working with you. Here’s what every agent needs to know about direct mail strategies. Direct mail is a low-cost mass advertising method that lets marketers target entire populations by region. These tools make it extremely affordable to connect with hundreds or thousands of individual consumers simultaneously. This makes them quite convenient for busy real estate professionals. 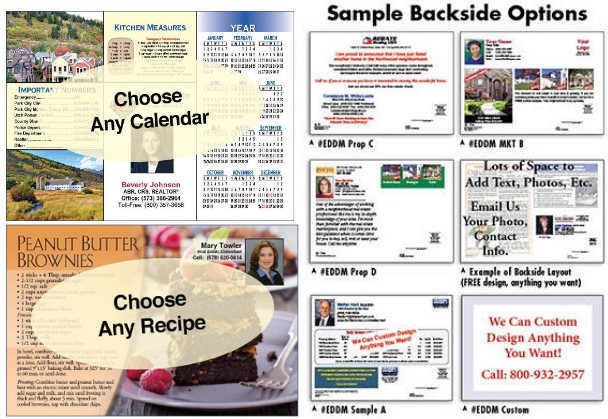 Mailers can take many forms, including recipes, useful wall calendars and holiday greeting cards. It’s up to the business to decide what kind of content it wants to feature, such as listing images, friendly headshots and contact details. In other words, it’s a low-risk, high-return way to work out the kinks while exploring campaign strategies. Why Does Direct Mail Suit the Real Estate Industry So Well? Mail is an attractive alternative to other advertising methods that have high barriers to entry. Realtors don’t need to pay for signage permits, mailing lists or other expenditures that aren’t always even worth the money they take to maintain. Since each mailer campaign is customizable, it’s simple to achieve unique goals. Real estate professionals can easily publicize recent neighborhood listings, promote property acquisition services and raise brand awareness in close-knit communities without feeling like outsiders. What Makes Direct Mail Low-Cost? 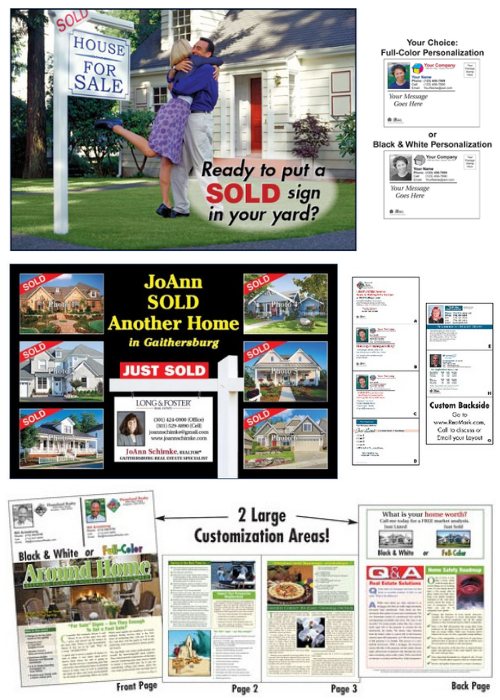 Cost-conscious realtors love the fact that direct mail campaigns grant them complete control over their advertising. Thanks to the widespread prevalence of bulk discounts and already-low rates, targeting a campaign to match a given outreach budget or reach a particular market segment is effortless. While prices vary, the best direct mail providers typically offer per-mailer costs of less than a dollar for items like postcards. Although this is often more than what digital outreach impressions cost, it’s important to remember that the comparison isn’t strictly apples-to-apples. Mail campaigns may have significantly more longevity than digital marketing can bring to bear. Their tangible presence, ability to target property owners exclusively and traditional feel all work together to grant marketing drives more trustworthiness. Unlike online ads, which get supplanted the instant Google or Facebook finds a new campaign to promote, mailers stick around in offices and homes. Someone who receives these promotional materials in the mail might not reach out until months or years after the fact, but when it comes to lead-building, late is better than never. Direct mailing strategies are just one way to make a mark on the world. For real estate agents, however, they’re essential tools with unmatched cost-saving potential. To learn more about the options, check out the selection at Reamark.com.